Home > Sports > Super Bowl Sunday! Name the Winner! Whats the Final Score? Super Bowl Sunday will take place on February 2, 2014, in East Rutherford, NJ. 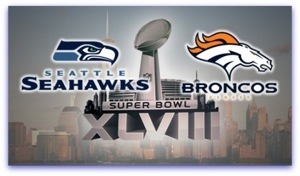 Broncos vs. Seahawks kicks off at 6:25 EST/5:25 CST and will be televised on FOX. 2. What’s the final score? 3. Check back and if you are right we have a gift for you from the Kingsmen Family!